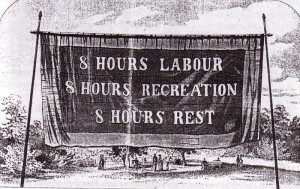 As is well known, the demand for shorter hours mostly disappeared from organized labor’s agenda after World War II, for complex and disputed reasons. 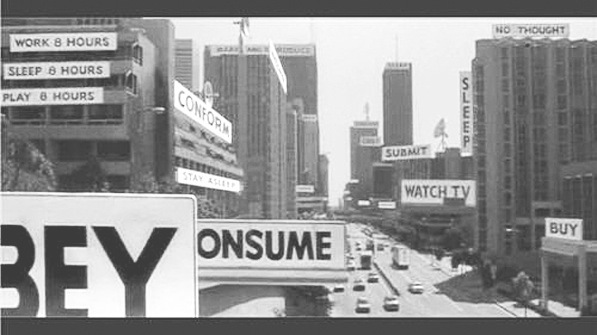 The sign I saw in They Live is one consequence of abdicating the postive class argument for shorter hours. By the time the movie was made in 1988, the eight-hour movement’s greatest slogan could come to seem not like a cherished victory of the working class, but rather as a piece of dystopian propaganda. 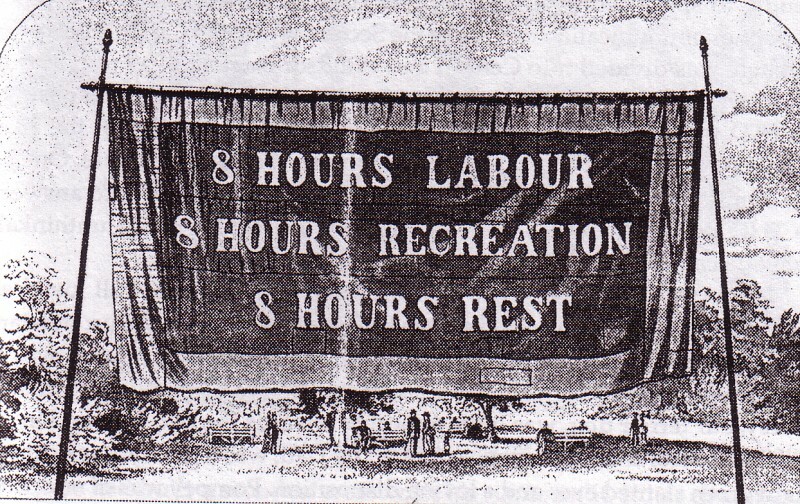 “Eight hours recreation” becomes the command to “play eight hours”, and this “play” is refigured as obligatory participation in consumerist culture rather than the opportunity for political, intellectual and moral development that it signified for the eight-hour campaigners. Perhaps it’s not surprising, then, that these days long hours are often portrayed as an issue of individual preferences or “workaholic” psychology, rather than the outcome of organized labor’s long political defeat. I have a feeling this little vignette will end up in my dissertation somehow, although I don’t think I mentioned doing any cultural studies in my fellowship proposal. On the occasion of Osama bin Laden’s death, I’m dusting off something I wrote a long time ago but never bothered to publish anywhere. The brief essay below is about six and a half years old, and it was written shortly before the 2004 U.S. elections. Bin Laden had just put out a tape, now mostly forgotten, in which he seemed to be inserting himself into the election in an especially bizarre way. At the time, there was lots of chatter about how this tape would help Bush’s re-election, particularly because of the way bin Laden’s comments seemed to echo things that the left was saying about Bush at the time. The whole affair caused me to reflect on the bizarre way that Americans allowed bin Laden to affect the national discourse after 9/11. He disrupted our society just as much through his rhetoric as through his violent plots–and that rhetoric sometimes appeared to be a self-conscious parody of the rhetoric of American power. How, I thought, could bin Laden not be aware of the power he held to discredit ideas in the eyes of mainstream American opinion, simply by associating himself with them? Thankfully, he can no longer perform this role, but the underlying problem–the way we allow official “enemies of America” to exercise a veto over our political discourse–persists. Finally, the suspense is over. We’ve gotten the answer to the question on everyone’s mind: what does Osama Bin Laden think about the US Presidential election? The release of a new Bin Laden tape in late October would have become the center of the electoral contest in any event, but now Bin Laden has intervened directly in American politics. Previous tapes have directed themselves primarily at Bin Laden’s presumptive umma, the disaffected Muslims who provide his recruits. For Americans, Bin Laden had only threats and invective. Now, however, he appears to appeal directly to Americans, over the heads of their leaders. “Security is an important pillar of human life”, says Bin Laden, and “we only engaged battle with you because we are free persons”. What are we to make of this new pose, with Bin Laden cloaking himself in the language of American democracy, in tones of empathy and conciliation (admixed with violence and threats)? With Osama Bin Laden, nothing can be taken at face value. Every sector of American culture has spent the past three years constructing Bin Laden as the personification of all that is bad, to the point that he has become both the author and the embodiment of evil and untruth, to an almost metaphysical degree. Osama is radical negativity. Any position becomes nearly impossible to affirm in public as soon as it has been upheld by Osama Bin Laden. As a consequence, Bin Laden has gained a seemingly magical power to pollute and corrupt any discourse in which he intervenes. His latest intervention seems conscious of this, in the way it deploys tropes of the domestic anti-Bush left: the commentary neatly wraps together the allegations of Bush’s slowness to react on the day of the attacks (including even the “My Pet Goat” incident shown in Farenheit 911) with the effort to connect American foreign policy with the roots of terrorism. Does Osama understand what he represents to Americans? Does he understand that anything he touches becomes anathema in our political discourse? If he does, then surely he knows that his comments are a gift to George W. Bush: now that Osama has raised questions about the prudence and competence of Bush’s policy, no-one else can legitimately do so. David Brooks understands this. In his New York Times column, he dutifully acts as a reflexive puppet of the Bin Ladenist rhetorical virus. “What we saw last night was revolting”, he says of the video. “Here is this monster . . . trying to insert himself into our election, trying to lecture us on who is lying . . . with copycat Michael Moore rhetoric about George Bush in the schoolroom, and Jeb Bush and the 2000 Florida election.” Brooks drips with an ominous discursive authoritarianism, carried on the winds of innuendo and suspicion. Bin Laden talked about Bush lying. What does that tell you about those who call Bush a liar? Bin Laden criticized Bush’s behavior on 9/11. What does that tell you about people who criticize the administration’s response to the attacks? And so on. The power of Bin Laden is already there, and Brooks has only to invoke it. Simply remind the audience that Osama said this, and watch the life drain out of a once-cutting piece of political invective. Parody, wrote Jonathan Swift, is the act of impersonating the style and manner of those whom one wishes to expose. The latest incarnation of Osama Bin Laden is as a parody of the American empire. Here is a man whom westerners utterly identify with murder and evil, declaiming that his acts of carnage were all in the service of “liberty” and “security”; the parodic echo of Bush is obvious. Here, too, is Bin Laden, addressing the American people directly—as if any American cares to listen to his disingenuous sympathy. Bin Laden’s feigned concern with the American right to security mocks Bush’s lectures to Iraqis and Afghans about the gifts of freedom and democracy their new occupiers have brought them. If, at one level, Bin Laden has propped up Bush by undermining all rational criticisms of his administration, he has also introduced an element of radical absurdity into the logic of the American empire: in Bin Laden, we see the ludicrous reflection of perpetual war for perpetual piece. Bin Laden the radical negation of criticism, and Bin Laden the parody of empire, both serve to undermine reason as a basis for policy or political discussion. Most viscerally, Bin Laden provokes the furious outrage which Brooks wants us to feel. That rage fuels the continuation of the “war” in its present form, which suits Bin Laden’s needs as well as it suits Bush’s. One does not have to be a conspiracy theorist to suppose that if Bin Laden did not exist, American conservatives would have had to invent him.